One thing that Grant Morrison wanted to do with his run on Batman was to reclaim all those goofy old Silver Age stories and drag them, kicking and screaming, back into modern continuity. "Yay?" Planet-X Batman and Bat-Mite are both living proof that the influence of Batman's quest for justice reaches far beyond Gotham City. While they differ greatly in size and origin, both were inspired to dawn Dark Knight-inspired costumes as masked heroes after observing Batman's crime fighting styles from Afar. 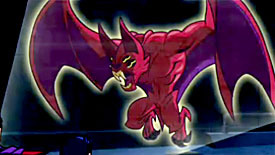 Planet-X Batman, a native to the distant world Zur-En-Arrh, has prior experience successfully teaming up with the Caped Crusader, while the mischievous and fifth-dimensional Bat-Mite has been known to be more of a nuisance than an aid. That's an accurate synopsis of Tlano, the real Super-Batman of Planet X, but this toy isn't him: this is Bruce Wayne of Earth, as seen in Grant Morrison's "Batman: R.I.P." storyline. In his usual crazy-prepared way, Bruce created an emergency backup personality in case his mind was ever attacked - that personality was the Batman of Zur-En-Arrh. They're two different things, and this one is clearly the modern version. How can we tell? By the pixels big stitches all over the place. Bruce sewed this costume himself in an alleyway while coming down off a mixture of heroin and "weapons-grade" crystal meth, using materials he found in the shopping cart of a dead bum. You know how it is. Consequently, there are big, sloppy stitches all over the suit. Amazingly, the stitches aren't just painted on, either. While the underlying sculpt of the figure is the Four Horsemen's DCU Classics "Medium Male" body, it's had to be retooled for this figure. The head makes sense, since those are always getting redone - the torsos never used to get this kind of attention. There are sculpted stitches over his ribs and up by his shoulders. The pointy, flared shoulder-flaps that were part of the original Super-Batman design are here as well. He also gets a new belt that no previous Batmans have had: it's smooth and simple, and has the Bat-Radia (Tlano's main piece of equipment) hanging off the left side. Or maybe it's just a normal radio. While Earth Batman tends to wear dark colors and hide in the shadows, Zur-En-Arrh Batman had the confidence to dress in bright colors to fight crime - something Robin had been doing for years, incidentally. The body of his suit is red, the sleeves are yellow, and everything else is purple. He gets a unique black bat-symbol on his chest, which means that Bruce took the time to sew that on while he was tripping balls. He couldn't patch the holes in his cape, but he could make a batsymbol. You'll definitely want to check the paint before you buy: it gets sketchy really easily, especially around the face. Batman's pack-ins also point to this being an "R.I.P." Batman rather than a "Planet-X" Batman. For instance, his only accessory is a baseball bat, something used in Grant Morrison's 2008 story and not in France Herron's 1958 one. It looks a little short for him, but that may because the figure is an oversized 6⅝" tall (not counting his ears), rather than the appropriate 6". Another half inch on the length of the bat would do wonders. The handle is wrapped in electical tape, and the wood grain is sculpted. 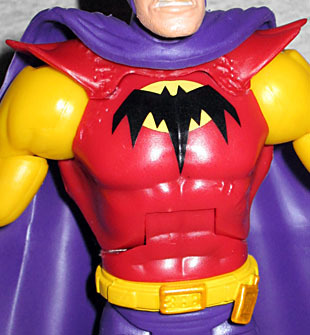 Secondly, Crazy Rainbow Hobo Batman comes with a new Bat-Mite, who was a big part of "Batman: R.I.P." and the stories leading up to it (though he was called "Might" for some reason). He was more sinister in Morrison's work than he had been previously, and seemed to have some kind of demonic insect-fetus-parasite clinging to his back. This toy doesn't. In fact, for the most part, this toy is the same as the Bat-Mite that came with Golden Age Batman - but since that was a Kmart exclusive and pretty hard to find, there's no shame in re-releasing it. Bat-Mite's not a straight repack, though! Instead of blue, his costume is now black. And while the sculpt is the same below the neck, the face has been redone. His sinister grin is gone, replaced with a pouty scowl that mirrors the modern Batman style. His eyes are thin and angry, but his mask still has that one floppy ear. 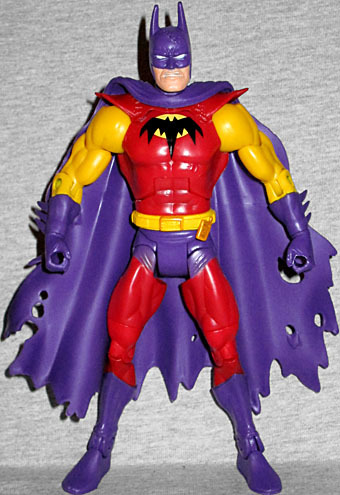 I'm not sure whether it's more surprising that Mattel made the Batman of Zur-En-Arrh, or that they haven't made one until now. He's bright colored and hurts to look at, just like most of the variations they make, so he seems perfect for being made into a toy. 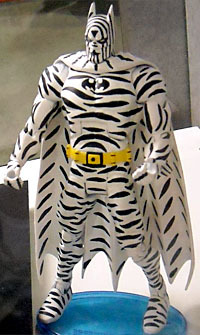 But then, fans have been hoping for Zebra Batman to become a reality ever since he was shown at SDCC '09, and that remains nothing but a joke designed to torment us. You really need to watch the paint on this one, but it's definitely not a Batman figure you've ever had before. And neither is the Bat-Mite. But now that we have two of him, how about Matty puts the Four Horsemen to work on a good Superman that comes with Mr. Mxyzptlk?